This recipe for vegetarian curry is healthy comfort food. 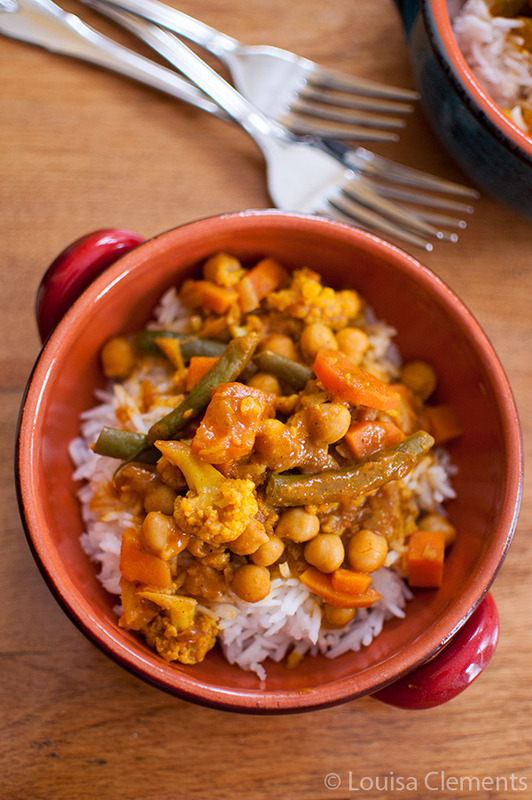 This vegan curry is packed with chickpeas cauliflower, carrots, sweet potatoes and green beans. I know it’s hard to believe that there is such a thing as “healthy comfort food” but this Vegetarian Curry is that. I know, I really didn’t think it existed either. Another bonus to this recipe is that it actually happens to be vegan, which is a pleasant surprise for those of us trying to include more vegan meals into our diets. Cutting down on meat is something that I’m always trying to do, so creating dishes like this vegetarian curry where you don’t even miss the meat are amazing. I actually prefer vegetarian curries to ones with chicken or pork in them. It might surprise you that curry is a new love of mine. There were a few years where I didn’t like any kind of curry or any kind of Indian food at all, in fact, butter chicken was the only thing I would touch. It’s only been in the past year or so that I’ve started to love all kinds of curries; they just have so much flavour (it’s all of those aromatic spices). Often curry recipes will use a curry paste instead of a powder for flavour, but I opted for the powdered version here as I think this spice mix is more accessible than the paste. The important thing to do when using the powder is to cook it out over the heat before adding other ingredients as this helps build flavour. In addition to curry powder, I add extra flavour with fresh garlic and ginger, ground coriander, cumin and turmeric – these are all spices that are in the curry powder, but I like the added depth a little extra gives this dish. I am so glad that I decided to give curry (and cauliflower for that matter) a second chance! It’s packed with flavour and is perfect for this freezing, polar vortex filled winter we’re having. Along the idea of trying new foods, something I’m doing this year is trying more new things. Whether it’s new foods, new activities, new classes, new recipes or new restaurants, I feel like trying new things leads to new experiences and great memories. If left to my own devices, I feel like I could spend hours on my couch browsing Pinterest and binge-watching any show on Netflix. But I’m realizing that it’s so important to take life by the horns and go for it and try new things. This year, so far I’ve filled January with lots of new things. Everything from snowshoeing to going to a basketball game to taking a class in classical music theory, it’s kind of all over the place but I’m really enjoying it. I think this is especially important in the winter where it’s so easy to get stuck inside. I even tried a new style of photography for this curry – a high angle shot. I’m realizing that it’s a lot of fun to challenge yourself with new things. Watch the video below for a quick 45-second tip for the easiest way to peel ginger. How do you feel about trying new things? Have you tried anything new recently and been pleasantly surprised? Any ideas for new things to try next month? Add this healthy, vegetarian curry to your weekly menu! Cook onions for 3-4 minutes or until softened. Add garlic and ginger, cook for another minute. Add spices, cook until fragrant. Add crushed tomatoes, stirring to create a paste with the spices and onion mixture. Add coconut milk and vegetable stock. Bring to a boil, reduce to a simmer and cook uncovered for 15 minutes. 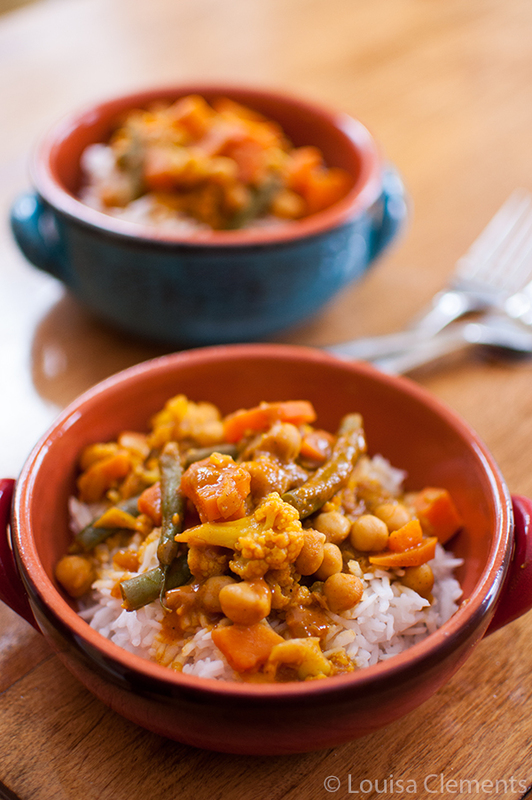 Vegetarian Curry is a healthy delicious comfort food for these cold winter evenings. There are soooo many people who love curry & while I'm not not one of them, I must comment on your new angle for photographing your delicious & delightful recipes...It works! And, oh my goodness, you do have a varied variety of interests which makes your life most interesting, I'm sure! I wish you a great day! Mmmmm curry is a great dish to have around this season! Which curry powder did you use - there are all sorts of curry powders? I love the Oriental one (or S&B) one, it provides a bit of Asian and Japanese flavor. Hi Rika! I just used a basic curry powder for this one - that oriental curry powder sounds delicious! I'll have to see if I can find that here. I simply love curry, especially in the winter. Oddly, I crave it when I have a cold too. Something about all those spices makes me feel better. Your looks delicious. Love all the vegetables in it. 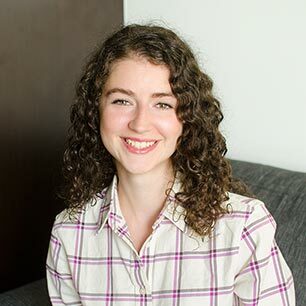 Thanks, Natalie - I crave curry when I have a cold too! I think it must have something to do with the spices and the comfort of it (also all the veggies don't hurt!). The recipe sounds great. I love cooking veggie curries, they have so much more flavour than meat ones. I have a friend who showed me how to cook really good Indian curries and one thing he was telling me about was how potatoes soak up the flavour. Great food. Thanks, Jon! Love that tip about potatoes, I didn't know that. Next time, I'll definitely have to add some potatoes and see how it goes. I love how easy this recipe is! I am one of those who has always loved curry, and I think that love just grows every year. There are so many different kinds of curry, and the flavors are so intense and unique, its hard not to want it at every meal! Thanks Danielle, it's one of my favourites too! We made this tonight - but the 15 minutes was not enough time to cook the vegetables. Do you have an update?